The modern day movement of Zionism is most visibly traced back to a man by the name of Theodor Herzl. Theodor Herzl in Basel, 1897. 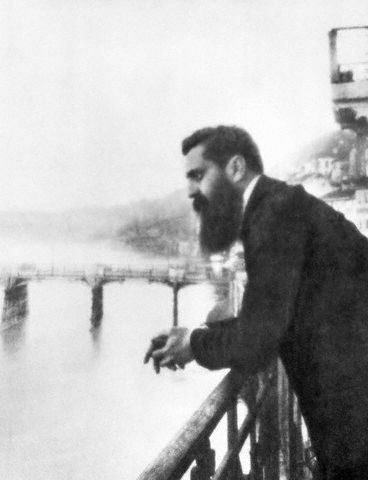 Known as "the father of Zionism" Herzl was a Jewish Austro-Hungarian journalist who wrote "Der Judenstaat" (The Jewish State) in 1896 which proposed the establishment of a Jewish homeland in Palestine (modern day Israel) to avoid growing prejudice toward Jews in Europe. The pamphlet (later published as a book) gained widespread attention, which included the support of a Christian reverend named William Hechler (known as the first "Christian Zionist) who believed "the second coming of Christ" depended on the Jews return to "their" homeland. Hechler was well connected and managed to introduce Herzl to German royalty, which although did not gain him access or promise to a future homeland for the Jews, it did serve its purpose in gaining more support amongst the public for the cause of Zionism, which is to say the movement for the establishment of a Jewish homeland. Although this cause seems noble enough on the surface, as you continue to read you will find it is much more questionable than what we have been led to believe to say the least. Herzl and his affiliates were offered Uganda by the British  and even Mesopotamia by the sultan  of the Ottoman empire (Middle East Turkish empire) but turned them down. Of course, we could argue these options were turned down by Herzl because Palestine is the "Holy land" from which he and his supporters feel entitled based on an ancient "promise" in the Bible. This argument, however popular it may be, is simply not accurate. According to Herzls own words written in his diary whilst seeking financial support from the powerhouse banking family of the Rothschilds, "I can only use this... Sinai peninsula, Egyptian Palestine. Cyprus." Herzl then asked Lord Rothschild "Are you for it?" who in turn grinned and answered "very much." From this we quickly learn that it is not the "promised land" Herzl and his affiliates are after but an area, presumably one of geostrategic importance and judging by the money minded Lord Rothschilds response, rich in natural resources. This assessment, according to the Evening tribune was made by "skilled geologists" after General Edmund Allenby captured Jerusalem in December 1917. In addition to these findings it was reported by "Popular Science" in Septemeber of 1929 that Dr. Georges Claude discovered $50,000,000,000 worth of gold contained in the dead sea. It is also worth mentioning that the Rothschilds had their agents on the ground long before any of those assessments were conducted  and when one considers the banking families legendary "know how" of staying 2 steps ahead of everyone, it is not so far fetched to imagine they were well aware of this in advance. It is also interesting that Herzl at first was met with resistance by the House of Rothschild, this as we know now changed, perhaps due to Herzls persistence and gain in public support, thus proving himself a useful instrument. According to the author of Genesis (a topic of dispute amongst historians as there is compelling evidence that suggests Moses was not the actual author) Abram was told by his god that the land of Canaan was to be given to his descendants. What is mentioned later, however, is by "given" the authors god actually meant taking through the use of brute force and terrorism. "I know your afflictions and your poverty--yet you are rich! I know the slander of those who say they are Jews and are not, but are a synagogue of Satan." Whatever you may believe, please consider what has been presented before you from an objective and detached perspective. Imagine there are no flags involved, skin colors, religions, etc. just ethics and morality guided by that moral compass we all presumably have deep within. This, however, is not where the troubles between Israelis and Palestinians began but instead can be traced to the shady dealings of the British imperialists who, in pursuit of victory through different alliances in WW1, both promised the Arabs the land of Palestine (through "Lawrence of Arabia" who was so ashamed of these deliberate lies became suicidal according to his own diary and the McMahon - Hussein agreement) and the Zionists through the Balfour declaration (which is another story in its own right, one that will have enormous ramifications on propagated history). 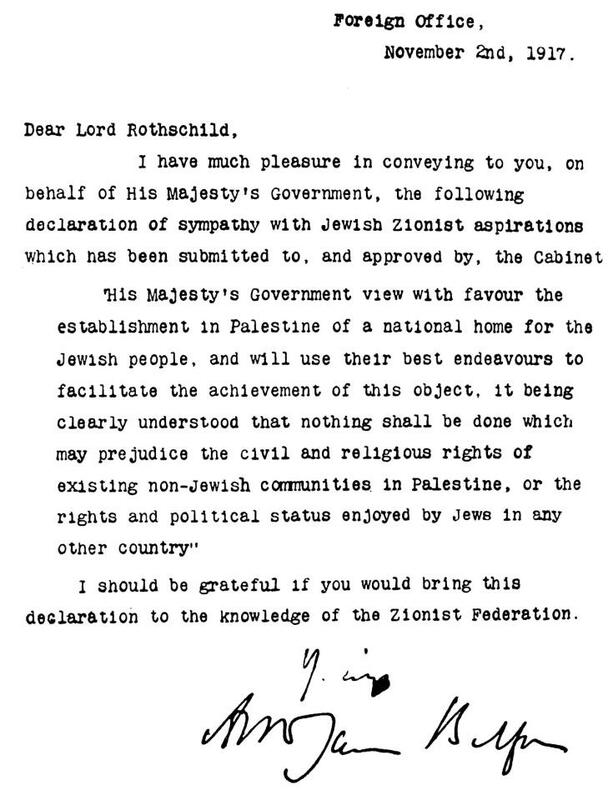 The Balfour declaration addressed to Lord Rothschild. This is where the roots of the conflict today can be traced. This, however, does not even begin to scratch the surface on the terrorism that has been used on the Palestinian population to remove them from their homeland. I leave you with a documentary made by a former Israeli soldier that documents the history of the crimes against the Palestinian people and will also demonstrate that the terrorism, which is so often reported by mainstream media on the Palestinian side is simply blowback and the result of a much more sinister root cause. In conclusion I would like to add that the average Israeli citizen is not necessarily a party to these crimes nor is the average Jew, they have simply been manipulated through propaganda to believe they are the "good guys" and the outside world don't understand (which is partly true). Throughout history it has always been the actions of the elite and to blame an entire people only serves to reinforce the divides which allow us to be so easily manipulated and ruled over. Awareness is the key, along with understanding and cooperation because as cliche as it may sound. united we stand, divided we fall. The average person is a moral human being and Israelis are no exception here. But, just as it was so in South Africa during apartheid, the elites propagate an entirely different world view and dehumanize the opposition, as the saying goes, "He who controls the present, controls the past. He who controls the past, controls the future." Make no mistake about it my friends mankind is on the verge of the greatest conflict of all time and that conflict is not between races nor religions but between the elite and the rest of us. The question is what are you doing in the present to help change the future? If not you then who, if not now then when? old Testament was not written on directives of Rothschild ,6.5 Million Jews were executed by Hitler ,Christian Europe hated them for killing Jesus on behest of powerful Pope ,forgetting Lord Jesus was a Jew Himself ,born of a Jewish mother Mary . 6.5 million jews murdered by Hitler? Man-o-man...you're one of the more ignorant people and there is no excuse for your ignorance other than pure laziness!!! You are one of those ignorant people who watch a video on YouTube or read an article someone forward them and think you are now educated and knowledgeable. Well, you are not either of those two. posting this link to this video on youtube shows the "quality" of your information. My aunt is an Auschwitz survivor and both my parents are Holocaust survivors. You belong with the rest of the Nazis of the world, The white supremacy members and the Arab world who just want to get rid of Jews. Just because we are Jewish. I have news for you, It will never happen, not on your watch or anyone else. We have G=D to watch over us, Why cant you get it?? Why do you launch into a typical, tried, tested and true theatrical routine by accusing Jerry of being a 'Nazi', a 'white supremacist', and someone who just wants 'to get rid of Jews.' You want to hammer him down pretty hard and fast don't you? What are you scared of? The monthly compensation cheques being stopped? I do not believe that your aunt or your parents are 'holocaust survivors'. I think that they are as much 'survivors' as Elie Wiesel, who falsely claimed to have been released from two different 'concentration' (work) camps, at two different times, by two different armies, the American army one time, and the Russian army the other time. Yet nobody dares challenge the fake facts of this new religion, because the Jewish-run governments of much of this world dictate to us that the 'holocaust' really happened, just as Eli Wiesel still tells everyone. It is more than just big business, as the Judaic NWO intends to run the entire planet, with zero opposition. Read the book 'The Holocaust Hoax Exposed' by Victor Thorn to understand that the holocaust is a total fraud that could never have happened. See also the other excellent book by Arthur R. Butz, 'The Hoax of the Twentieth Century The Case Against The Presumed Extermination Of European Jewry'. When Eisenhower wanted 1.5 million Germans dead after the war, he simply put them in a REAL concentration camp, he put POW's, women and children in open fields surrounded by barbed wire, with no shelter, no latrines, no food and no water, and they all died. It takes 7 days for someone to die like that, and they don't need haircuts, tattoos, stripey clothes, currency to spend in canteen shops, post offices to mail their folks and receive Red Cross parcels, Synagogues, hospitals, Mess halls, Laundries, Bathhouses, latrines, Theatres and cinemas, sports facilities, including swimming pools, even brothels. All of these facilities were standard in all camps except for swimming pools, but the rest were common to all camps, and not just the alleged propaganda camp used for newsreels. And such camps certainly would not need any gas chambers either for the above reason. Only 3.5 million Jews lived in all of occupied Europe, and at the outbreak of hostilities, 2 million Jews went to Russia, 250,000 Jews stayed in France and were never deported, 150,000 Jewish soldiers and their families also remained in Germany or in service elsewhere, 50,000 Zionist Jews were shipped to Palestine to be resettled there after work training by the German government to ensure they would be able to support themselves, and a medal was struck to commemorate his agreement, which was only halted due to allied military action preventing further transportation of Jews to Palestine. Over 5 million Jews claimed for compensation after WWII, according to the finance minister of the German government, and 1 million are still alive today, still claiming. Around 15 million Jews lived worldwide year after year immediately prior to WWII, according to annual censuses conducted by several Jewish authorities, and this figure of around 15 million, with an actual increase of 300,000, continued to be evident in each year immediately following WWII. The 6 million myth had been attempted even in WWI, and the Jewish authorities who had conducted those censuses were not clued up enough to lie along with the newly-created myth until much later. The official International Red Cross figures state that a total of 271,305 people died in all the camps, of all nationalities and political groups and races, with about 50,000 to 70,000 of these being Jews. Fatalities were never by any kind of gassing, and this evidence was established by American military officials, but their evidence was never allowed to be presented before the courts at Nuremberg. Deaths were due to heavy bombing destroying train and road routes throughout Germany, leading to mass starvation throughout all of Germany, with mass outbreaks of dysentery and typhus, and I have seen a photo of well-fed inmates laid out dead in stripy clothes in front of barracks with bombed-in roofs, so bombing by the allies claimed some lives also. There was a holocaust all right, but it was only of the German people. Churchill proposed a war of annihilation of the German people by heavy bombers, to destroy the strength of the German people 'once and for all', even suggesting gas and anthrax bombs, as lethal as atom bombs. Louis Nizer, a leading American Jewish lawyer, wrote a book discussing the pro's and con's of exterminating or simply sterilizing the entire German people. If Hitler had really wanted to kill people in the camps, that is all he needed to have done, and saved vast resources for the rest of the German people. 150,000 non-Communist Jewish soldiers fought for Hitler, along with soldiers of Japanese, Chinese, African (both black and white) Indian, and Tibetan origin, as well as those of numerous other countries, with Muslim, Buddhist, Sikh, Hindu, Daoist, Christian and other faiths included, fighting shoulder to shoulder as brothers against the Bolshevik hordes of Stalin's army who intended to annihilate all other peoples across Europe, and ultimately the entire world. Do you honestly think that if Hitler really had been killing Jews, that he would not have faced a mutinous bloodbath amongst his own men from heavily-armed and extremely well-trained Jewish servicemen throughout all the military services, supported by many other soldiers of other races and religions? Execution was the penalty in the German army for any soldier guilty of murdering Jews. Racism was not tolerated, though Hitler certainly launched some powerful speeches against Communist Jews, as well as Capitalist Jews, who would not cooperate with the National Socialist state as other Jews were doing. You can see excellent evidence for this on YouTube, which shows photo evidence from books that cover the subject in more detail. After the war, 8-11 million German civilians were murdered by slow starvation, amongst other methods, and the so-called 'concentration' camps really were used for that purpose then, in such a manner as to truly exterminate people intentionally. Some of the photographs you see of great piles of dead, matchstick-thin people posed as Jews, are in fact those of Germans who starved to death after bombing raids. If your aunt and your parents really had been in any kind of 'extermination' camp, they would have been dead, end of. Do more research, there were no mass executions of the Jews at the concentration camps. I believe, with respect, If youwere infilled by the Holy Spirit , you would have a better understanding of the holy scriptures,, God is not that simple,What you write about is true, but not THE truth,, there are unrevealed concepts and precepts in scripture.. .. God owns Israel, He is revealed through out the culture.. There ARE those who exalt themselves against the knowledge of God, He wishes all should come to Him, sadly not all will.. But Israel belongs to Him and He will be revealed to the world again through these coming days.. I hope that all sides would stop, and be saved, but the evil that drives the rothchilds, needs to be stopped.. and It will , Jesus will rule from Jerusalem, the Jews who have returned to Zion will accept him, The prohecies are being fulfilled almost daily at the moment.. look Up.. The best we can do is pray for the peace of Jerusalem, and that all would bow the knee in reverence and repentance, while there is time.. Blessings.. Thank you for this lucid account of where Zionism began. As a scheme to benefit certain of the Elite. Just find in youtube a lecture from the late Ahmed Deedat regarding this Canaan land will be given to Abraham descendants.. If i'm not mistaken the lecture topic is "Arab and Israel Conflict or Conciliation". To 22Y: You are preaching something called "Dispensationalism"..Check out something called Preterism for a blanced look at Mid East problems. SEan Factor: All you ppl do is whine...you did refute what he said I noticed. Moses was not Jewish, but a Hebrew. The Twelve Tribes were not called Jews at that time. Good read though!
" in 1896 which proposed the establishment of a Jewish homeland in Palestine (modern day Israel).." there was no palestine in 1896 it was an area included in the Ottoman Empire. And actually the area that was called palestine was the area that is now Jordan and Israel, and it's was part of the British mandate since 1922. There was never in history a sovereign entity called Palestine. But, as the rest of your lies presented in your hateful article, I don't think that you're interested in facts .. enjoy your ignorance and continue to spread your lies and hateful ideas. Educate yourself before showing your stupidity! !!! There was no Israel before 1948 !!! Great article based on HISTORIC FACTS! Keep up the good work! Why did you leave it then? I am not against Israel because it is a Jewish state. I am against theft (that is to say, of land), displacement, and genocide. All these crimes are being committed by the state of Israel, and the Israeli settlements that are illegally, according to Israeli law even though it is not enforced, set up on Palestinian land. I am against other states committing these crimes as well. There are Christian churches who approve of Israel because they think that the second coming will happen with the establishment of the Jewish state. What these churches ignore though, is the atrocities that the Israeli soldiers commit, like the ones that the Hebrews committed in the book of Joshua, and Deuteronomy. These churches ignore the fact that the Palestinian people have a fundamental human right to live in peace, on land they lived on for generations. I wonder if anyone else have noticed any similarities between the theft of the Palestinians land by the Israeli state, and the theft of the Welsh lands by the English, also, the Cherokees land by the White settlers and the American government? I have no quarrel with the English and the American people, only the Theft that went on. Likewise, I have no quarrel with the Jewish people wherever they live, only the theft of land. It is too late to stop the theft of the Welsh, Cherokee and Metis land, but it is not too late to stop the theft of the Palestinian land. Saying that, what is too be done with the Jewish people who have been living in Israel since 1948? I would not approve of the Palestinians displacing them either.